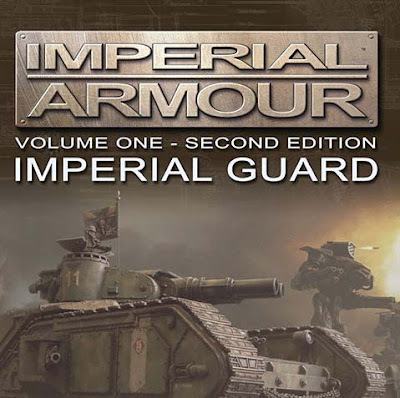 Looks like the fellas over at Forge World have decided to update the old Imperial Armour books. We all just got notice that Volume One is being released in a Second Edition format that is supposedly "rewritten and expanded to be fully compatible with the 6th Edition of Warhammer 40,000." I haven't thumbed through my what is now "old" IA1 in a long time. Mainly because I don't do too much with Guard or the Imperial Navy aside from drool over their cool tank options. I do think it's kinda nice to have all the new stuff collected into one book. If nothing else, it will clean up everything and you no longer need to keep up with errata sheets and updates and such. At least for the time being. I saw the list of contents as well in the FW email, but I didn't compare it to the previous book. I think they mentioned including a couple new things, but most of it looks like it's going to be old stuff just "updated" and brought in line with 6th edition. Maybe they'll squeeze in some new artwork too. Do you even need to buy Imperial Aeronautica? Good news. Added to my to-purchase list. Cheers for the info, Ron! I found a really bad (but free) PDF of the aeronautica book as the only page I needed was the sabres page & roughly $50 is a bit much for one page out of a book, especially after having already bought 3 of those things. GrimKlaw: No problem, I'm not big on press releases since they are more of a timing issue, but I thought it interesting that FW is redoing the line (I'm assuming they will move through the rest of the books in order). Hopefully Guard players get something out of this. I suspect it's like the Imperial Aeronatica book that came out recently though. Nothing new if you already have the old book and the FAQs. Da Master Cheef: At least you saved yourself some money. I can see how $50 for one page of rules is a little steep. I think it's unlikely that Forge World would edit/republish the rest of the Imperial Armour books past this one, as everything past #2 were based around a narrative campaign. With the volume of models released in books since, IA #1 is badly out of date and from what I remember from reading a borrowed copy, riddled with inconsistencies. I see the new version as a companion to Aeronautica; combined they cover FW's entire Imperial Guard/Navy lineup, which is quite extensive at this point. Yes, there probably won't be much for long-term FW fans who already have the old version and FAQ library, but I see it as perfect for anyone who might have been sitting on the fence about getting one, perhaps worried about needing to track down errata to bring them up to date. Anon: Maybe it's wishful thinking they might redo the rest of the books. Even if each one doesn't get an individual update (maybe combine books 2 and 3 into one). I think you've summed it up nicely though. I have to say I quite literally pasted bits from their update pdf into my copy. It's a nice, hefty book, but yeah: riddled with dire inconsistencies. Admiral: I do the same thing! I take the errata and cut it into small pieces and tape it into the relevant places in my books. I don't see them as collector items as much as I see them as workbooks that I can use. Sometimes I write notes in the margins too. Just got my copy today, and first thing I noticed is that they don't have skyfire included with the hydra-flak, which was FAQ'd on the GW website to include the ability quite a while ago. Otherwise, so far, a beautiful book. But it looks good overall? I haven't received mine yet.